There are few instances in which you can sum up the spirit of a couple using a single word. Debbie and Michael O’Keefe, however, are a rare exception to that. To encapsulate this husband and wife, there is only one word needed – faithful. So, it comes as no surprise that during their darkest days, of which they have had many, faith is what helped carry them through. The biggest test of faith for the O’Keefe’s came when they were faced with a disease that nearly took Debbie’s life. It began 30 years ago when she was diagnosed with primary biliary cholangitis; an autoimmune illness that destroys the bile ducts in the liver and eventually leads to end-stage liver disease. At the time of the diagnosis, they hoped Debbie’s disease wouldn’t be fast progressing. In 2007, though, it became obvious that her health was beginning to decline quickly. By 2016, Debbie’s disease was so far progressed that her liver was shutting down. Without proper blood filtration, toxins started to build up in her system, causing numerous complications; eventually, she suffered two back-to-back heart attacks and slipped into a coma. 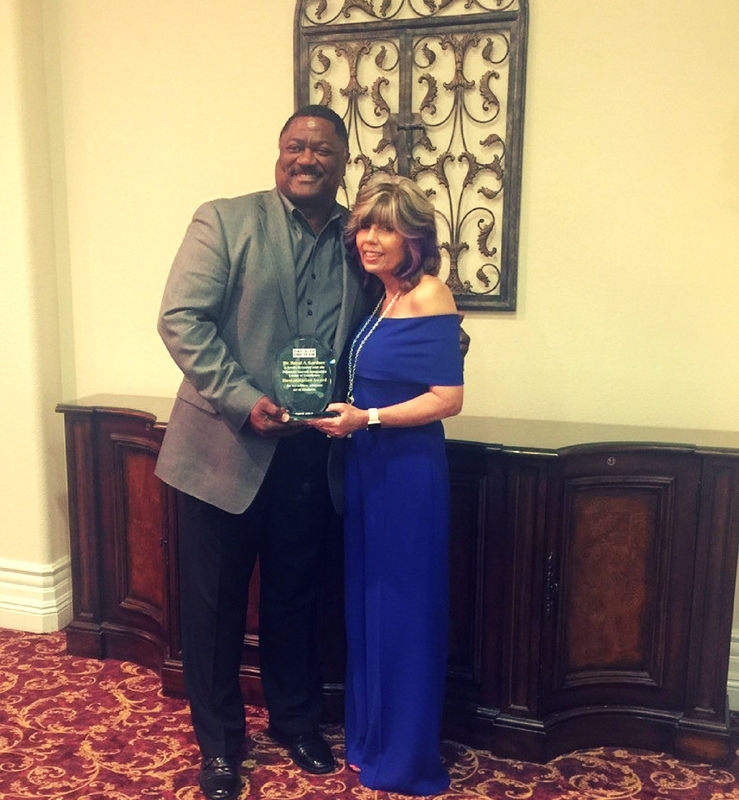 While she was on life support in a hospital in Lancaster, California, Michael, her son Chad and daughter in-law Jaimie, and several friends surrounded Debbie night and day. Despite the love and continuous prayers, Debbie didn’t have long to live. Her treatment options were few. There was only one thing that could turn all of this around – a liver transplant. The odds of her finding a match were not great, but her family and friends were all keeping the faith that a donor would turn up – and eventually, he did. For over a year, Debbie had been enrolled in the Mayo Clinic’s Living Donor Transplant Program. And up to this point, her family, friends, and even her doctor had undergone testing to see if one could donate half of their liver to help save her life. Sadly, there hadn’t been a match. Not long after she slipped into a coma, Michael got the call for which they had been waiting. Royal Gardner, a close friend and colleague of Michael’s had come up as a match. The clock was already ticking. Debbie’s condition was declining at a drastic rate, and now she needed to travel nearly 400 miles to the Mayo Clinic in Phoenix. Getting her there was going to be a challenge. Luckily for the O’Keefe’s, the hospital knew exactly who to contact – REACH Air Medical Services. With just one phone call to REACH’s 24-hour communications center, an airplane and highly trained medical crew were quickly on their way to Lancaster. Pilot Chad Davis and Flight Nurses Lena Servin and Nicole Richards of REACH 52 in Thermal were the responding crew. After a brief flight over to Fox Field, Nicole and Lena traveled to the hospital by ambulance, while Chad remained with the aircraft. When the ladies arrived at the hospital, the O’Keefes welcomed them with open arms. After being briefed on Debbie’s condition by the hospital’s clinical team, Lena and Nicole began the meticulous process of preparing her for transport. With her safely secured on a gurney and her ventilator, monitors, and medications switched over to portable equipment, they were ready for departure. Soon, Debbie and Michael were loaded into the back of an ambulance headed toward Fox Field. The ride is one that Lena and Nicole won’t soon forget. 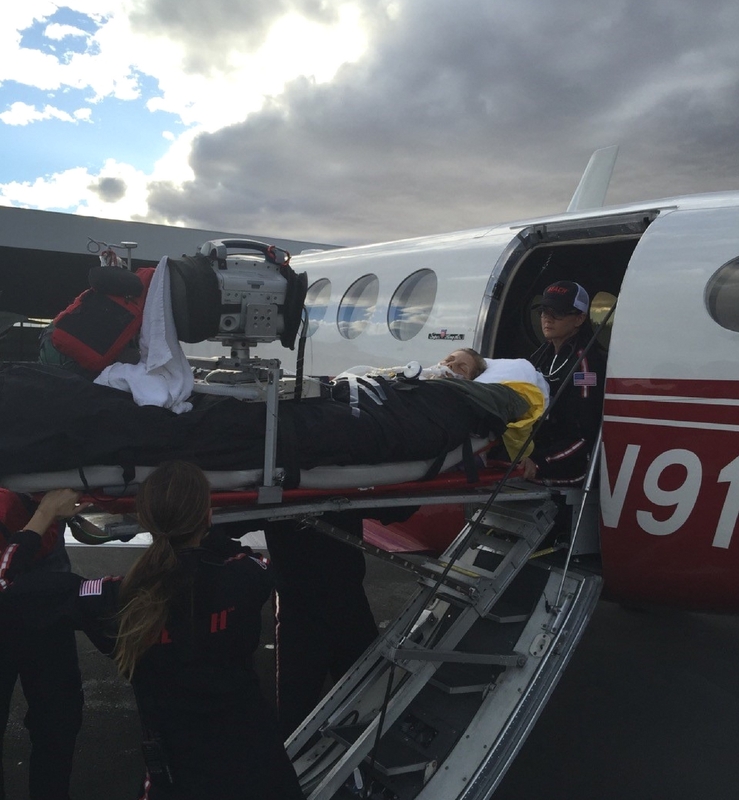 Flight Nurses Nicole Richards and Lena Servin loading Debbie into the aircraft in Lancaster, CA. While Lena and Nicole were bonding with Michael, Chad was having a unique and special experience of his own. As he waited for Nicole and Lena to return to the airport, a small crowd began to form inside the terminal – it was all of Debbie’s family and friends waiting to see her off. Shortly after Chad had given everyone a tour of the aircraft, the ambulance arrived and the crew began the careful process of safely securing Debbie in the cabin of the plane. After a few quick goodbyes, Michael and the crew took their seats and prepared for departure. Because a heavy winter storm was rolling through Southern California, Chad knew that the flight would be a little rough. However, he was confident that it wouldn’t inhibit Nicole and Lena’s ability to provide safe patient care for Debbie. With everyone prepared for a bumpy departure, Chad safely lifted off from the runway and headed toward Phoenix. The first twenty minutes of the flight were turbulent, but Chad did his best to navigate safely around it. As things began to smooth out and they reached their cruising altitude, Lena and Nicole were able to turn their full focus on providing care to Debbie, and in turn, a bit of emotional support to Michael. Debbie and her donor, Royal. Knowing that Debbie was in great care allowed Michael to relax and finally get some much-needed rest. Soon, Chad had the aircraft safely on the runway in Phoenix. From there, Nicole, Lena, Michael, and Debbie took an ambulance over to the Mayo Clinic where they would transition care to a waiting team of clinicians. After a successful transition and some heartfelt goodbyes, Chad, Nicole, and Lena packed up and headed back to Thermal. When they arrived at their base, the emotions from the day seemed to be lingering with each of them. And Debbie did have the best possible outcome. After nearly three months of preparation and care at the Mayo Clinic, she was finally well enough to undergo a transplant, and thankfully, the operation was a success. Royal, and of course, the love of her life, Michael.